Carnage and mayhem are part of the fabric of daily life in northern Nigeria, the result of a campaign of terror by the Islamist group Boko Haram. As the threat spreads to other regions, and countries, fears are growing that Nigeria’s government may not know how to counter it. Or may be making things worse. At the moment when the soldier slits the first throat, one body is already crumpled in the shallow grave, blood staining the sandy soil on the grave’s rim. In the background a line of victims sits patiently, as if waiting for a haircut at a barber shop. The grainy video, shot on a cell phone the last week of May 2014, shows three men, wearing camouflage fatigues issued by the Nigerian military, some carrying AK-47 rifles and machetes, who are joined by two others wearing civilian clothes. In all, three executions are shown. The victims are believed to be either sympathizers or members of the violent Islamist terror group Boko Haram, or possibly innocent civilians. The soldiers appear to be Nigerian military. Five years into an insurgency, Africa’s largest country is reeling. Carnage and mayhem that was once limited to the poor, largely Muslim northeast has spread elsewhere. 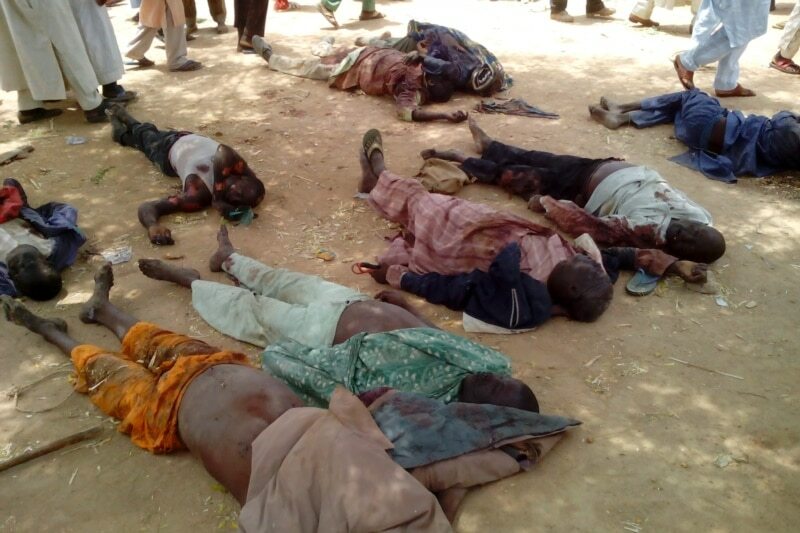 Boko Haram now openly challenges the government, its campaign to impose its fundamentalist view of Islam intensifying. Daily shootings are common in many places in the country; the capital, Abuja, has been hit repeatedly by car and suicide bombings, most recently on June 25. 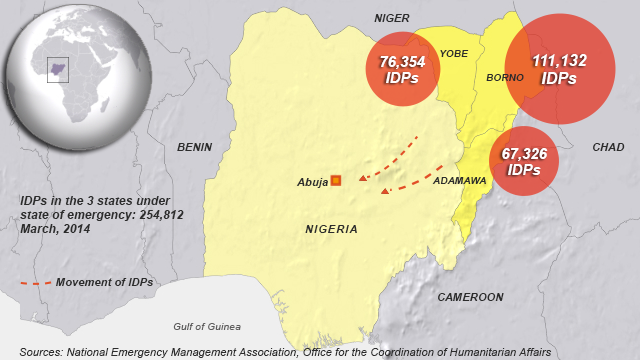 More than 2,000 people have been killed this year alone, according to rights groups, and an estimated 250,000 Nigerians have been driven from their homes in three northeastern states. The response of the President Goodluck Jonathan’s government has been mixed at best. Corruption is endemic in government institutions, particularly among security agencies, and the inability of security forces to rescue more than 200 schoolgirls abducted in the northeastern town of Chibok on April 14, has stoked questions of competence. One police officer who is a member of the joint task force serving in northeastern Borno state said troops are given just 30 bullets before heading out to patrol or search for Boko Haram. If you want more bullets, you have to bribe a superior officer. “How do you fight an enemy that comes to you with over a thousand bullets?” the officer told VOA. A growing number of experts and outsiders, in and out of Nigeria, worry that the tactics— extrajudicial killing, abductions, arbitrary arrests– used by government security forces to battle Boko Haram may in fact be worsening matters, terrorizing a population that was already dubious of the military and pushing them to sympathize with the militants. A report released Tuesday by Amnesty International documented evidence of extrajudicial executions, and other serious human rights violations by the military in northeast Nigeria. And an insurgency that can use poverty, corruption, historic grievances, sectarian enmity as fertile ground to grow and spread means all of West Africa and the region known as the Sahel is in danger. “What started as a local problem is now a regional problem,” said Peter Pham, a longtime Nigeria researcher at the Washington-based Atlantic Council. The heart of the insurgency is where it largely began: the city of Maiduguri, a city now paralyzed by fear. The sign at the entrance to the Borno state capital, Maiduguri, reads “The Home of Peace.” Yakubu Mohammed used to pass it regularly as he drove his bus along the 90-mile route, bringing passengers between the Cameroon border town of Gamboru-Ngala and Maiduguri’s busy commercial markets. On a day last August, as Mohammed made his outbound journey, militants stopped his bus near the village of Dikwa, midway to the border. Armed men, peering through the windows, ordered three passengers to get off the bus. “A gunman who looked like a 12-year old boy took the third person’s phones and money, then allowed him to climb back into the bus,” he said. In the Nigerian states hardest hit by Boko Haram’s campaign —Borno, Yobe and, to a lesser degree, Adawama— commerce, and for many, life, has sputtered to a halt. 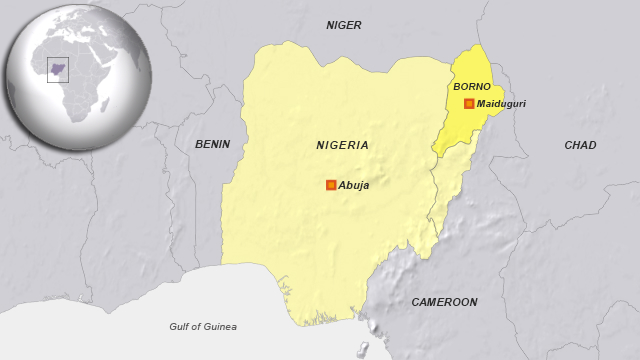 Borno, in the very northeastern corner, used to be the gateway for trade in agricultural products, livestock and textiles between the whole of northern Nigeria and the neighboring countries of Cameroon, Chad, Niger, Sudan, Central African Republic and even the two Congos. That’s pretty much come to stop in recent months as shuttle traders and farmers fear violence from the militants, said Alhaji Rijiya Bama, chairman of the Borno State Chamber of Commerce. “They don’t come now because (Boko Haram fighters) block the highways and kill the drivers, then steal or burn their goods” he said. Around the region, farms lie fallow, covered with grass, as farmers give up on planting, knowing that the militants will likely pillage their crops, or simply burn them. The cattle market in the Yobe state town of Potiskum used to be one of the largest in West Africa; Boko Haram attacked it twice; more than 100 people died in an attack there in 2012. Now it’s a ghost market, with few ranchers willing to risk their herds being stolen or killed. Despite the imminent rainy season, hundreds of combines, tractors and other mechanized planting equipment sat wasted and rusting at the headquarters of the Borno State Agricultural Mechanization Authority in Maiduguri. Officials have warned of severe food shortages in several states if the planting season fails. The oppressive fear isn’t limited to the rural regions, either. Maiduguri, a city of about 1 million that was home to many of Boko Haram’s central leadership, has been hit repeatedly by ambushes and bombings, including one on Jan. 14. On that afternoon, Salihu Usman, 16, was at home when he heard the sound of the explosion, coming from the direction of his father’s kebab shop not far from the post office in Maiduguri. The bazaar was mostly occupied by young people selling cellphone handsets and parts and repairing them. A car packed with explosives was left near the traffic circle, only a few yards from where his father was busy preparing skewered lamb kebabs for the afternoon and evening rush. Usman is his family’s only breadwinner now. After years of escalating violence, Boko Haram burst into the global consciousness in April, when its militants abducted more than 200 schoolgirls from the town of Chibok, 80 miles south of Maiduguri, and herded them onto buses and drove into the forests. The group’s leader, Abubakar Shekau, said in a video released days later that they were being held captive as slaves and would not be returned unless the government released imprisoned militants. One 17-year-old girl, who later escaped and asked that her name not be used, recounted the kidnapping: how she and others took off their head scarves and threw them out the window of the truck they were riding on. “The girls started removing their head scarves and throwing them on the road so that if soldiers heard that we were kidnapped, they would be able to follow and rescue us. So we kept throwing our heard scarves on the road, at night,” she told VOA. Under the hashtag #BringBackOurGirls, a campaign to publicize the girls’ plight and press the Jonathan government to do more to find them, went viral around the world, eliciting support and concern from celebrities, activities, politicians and public figures such as President Barack Obama’s wife, Michelle. Maiduguri, meanwhile, has become a haven for refugees escaping the dangers of surrounding towns and villages, and the destruction that has left whole towns and villages ravaged or abandoned. Boko Haram’s genesis lies in the complicated religious, sectarian and political realities of Nigeria, dating by some accounts at least as far back as its colonial past under British control. The country’s northern regions have seen sporadic bloodletting and interethnic clashes for many years, where mainly Muslim ethnic groups like the Hausa, Fulani and the Kanuri predominate. Communities in Nigeria’s impoverished north have long resented the relative wealth and clout of the country’s southern ethnic groups, like the Yoruba or the Igbo, many of whom are Christian. In the 1990s, when Nigeria was still under military rule, more extreme interpretations of Islam began to influence Muslim communities in the north. 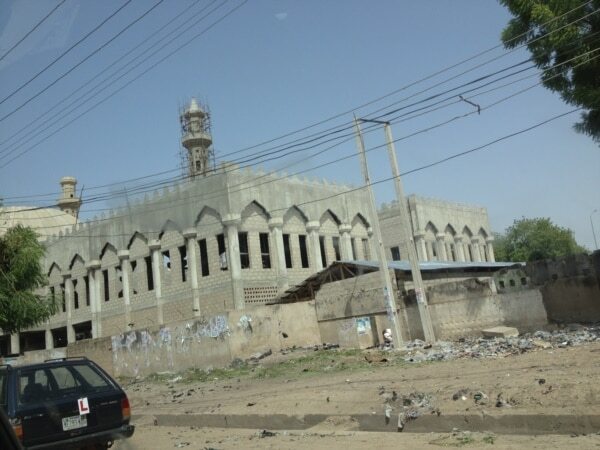 In some places, where Muslim religious schools similar to madrassas were established, adherents to this fundamentalist set of beliefs were dubbed the “Nigerian Taliban.” Violence was largely absent from the group’s teachingsThe exact date of creation for Boko Haram is unclear. Many scholars point to 2002, when university students and unemployed young people – mostly Kanuri— began joining a group known as “Al Sunna Wal Jamma” or “Followers of the Prophet’s Teachings,” led by a charismatic Maiduguri preacher named Mohamad Yusuf. Derived from the English word “book,” “boko” is a slang word from the Hausa language meaning “western education;” “haram” comes from the Arabic, meaning “forbidden.” Locals dubbed Yusuf’s followers with the nickname, largely out of curiosity. One of group’s founding principles was fighting the endemic corruption that has plagued Nigeria. Fueled by the country’s massive oil reserves, that corruption had left large parts of the north impoverished at the expense of the south, and put Nigeria near the top of global rankings of corrupt countries, according to the German-based advocacy group, Transparency International. With the end of military rule in 1999, Nigeria returned to democracy. In northeastern regions such as Borno state, politicians saw Yusuf and his adherents as a useful base for rallying political support. Ali Modu Sherif, who became Borno governor in 2003 with the help from this alliance, appointed a top Boko Haram official as his state commissioner for religious affairs. This effectively gave the group access to state funds to build mosques and other projects. Four years later, when Sherif ran for reelection, he ended his alliance with the group, beginning an escalating series of struggles that culminated in the summer 2009, when Yusuf was arrested and killed while in Nigerian police custody. Thousands of his followers were killed in the police crackdown that followed. The group went dormant and was thought defeated, until late 2010, when one of Yusuf’s deputies, Abubakar Shekau, released a video claiming leadership, threatening the government, and adopting many of the slogans and iconography used by al-Qaida-affiliates in western and central Africa. 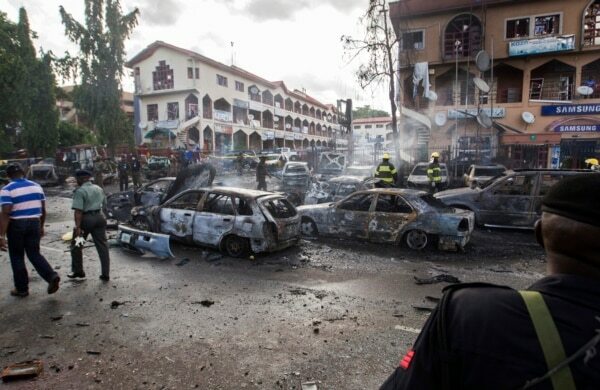 The first car bombings began the following year that targeted a police headquarters in Abuja and a United Nations headquarters. Its targets expanded to include not just police units, but also Christian churches and even Muslim clerics who opposed the group’s extremist vision of Islam. One such victim was Sheikh Adam Albani, a leader of Nigeria’s Salafi movement and former mentor to many Boko Haram followers, who was killed in February in an ambush by militants. Since 2010, the terror campaign has moved well beyond the borders of Borno state, even beyond Nigeria’s borders. The trend hastened by the near collapse in 2011-2012 of nearby Mali, which was nearly overrun by rebels and al-Qaida-linked fighters. Until intervention by the French military in January 2013, the power vacuum in northern Mali allowed Boko Haram militants to set up training camps. There, according to Pham, of the Atlantic Council, hundreds of Boko Haram fighters may have cycled through the camps, learning desert warfare tactics and Islamic ideology. Boko Haram’s al-Qaida ties, while tenuous, are worrisome to many experts. Pham said Shekau’s videos after 2010 bear some of al-Qaida symbolism and production qualities. Some of the group’s militants may have also trained in camps located in territory contolled by al-Qaida-allied Somali terror group, Al-Shabab. The car and suicide bombing that began occurring in 2010, previously unknown in Nigeria, have hallmarks of al-Qaida tactics. That means the organization, while low-budget, is tactically more sophisticated. And brutal, using decapitations, summary executions, car bombings of civilian targets and other means as part of its campaign. One video posted online July 22 appears to show Boko Haram militants interrogating, then gleefully decapitating a captured Nigerian air force officer. “What’s significant now is that they’ve been able to (seize and) hold territory and use that as staging ground for stronger attacks in other regions,” Pham said. On July 27, militants struck the Cameroonian border town of Kolofata, about a two-hour drive from Maiduguri, kidnapping the wife of the country’s vice prime minister. It was the third attack in Cameroon in as many days. With violence reaching new levels of brutality, President Jonathan in May 2013 declared a state of emergency in Borno and two other neighboring states. As local military and police units were increasingly outgunned and ill-equipped, the Nigerian government established the Joint Military Task Force called JTF, aimed at taking the fight directly to Boko Haram. The task force deployed thousands of police officers and military soldiers to places around Borno to set up checkpoints, conduct sweeps and make arrests. A new army unit – called the 7th Division— was set up last year, deployed specifically to Borno. There are growing doubts, however, that the country’s security agencies are capable of overcoming entrenched corruption and leadership problems to stem the violence. In dozens of interviews conducted in April and May in Borno and elsewhere, police officers, soldiers and government officials complained that corruption was hobbling efforts and sapping morale. Soldiers said that they often were deployed without being paid; one said that he and his unit spent three days in the field fighting, only to be given a paltry sum of 1,000 naira (about US$6). Many junior officers complain that superiors pocket the money meant for their allowances and for equipment. In May, army soldiers fired on the car of a general, whom they blamed for allowing the deaths of fellow soldiers at the hands of Boko Haram militants. 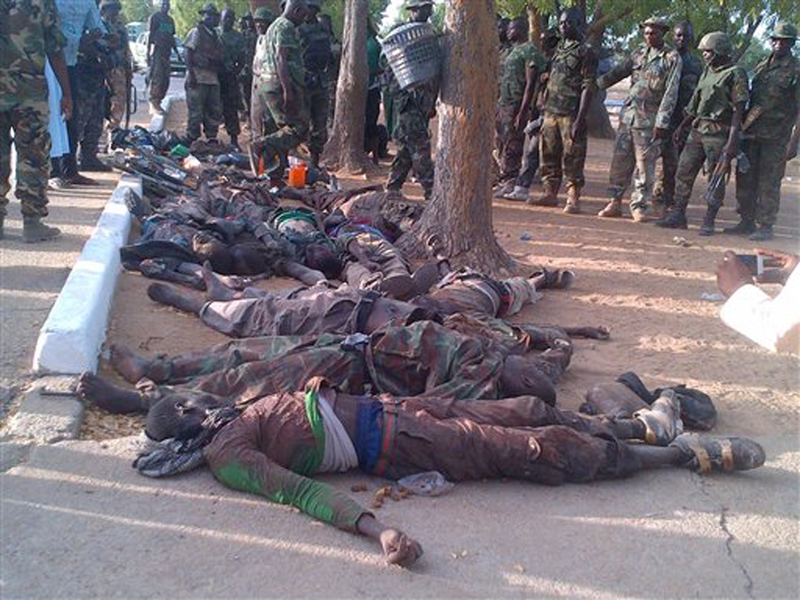 Other soldiers have reported that Nigerian military officers have defected to fighting alongside Boko Haram forces. One told VOA how his military unit, based in Borno, was ambushed by fighters in May, some of whom he recognized. Bama, the chairman of the Borno State Chamber of Commerce, said not long ago he was driving near the village of Kawuri southwest of Maiduguri when he witnessed an ambush by Boko Haram fighters. The militants chased a motorist trying to escape the ambush and killed him not far from a military checkpoint near Konduga. The soldiers looked on, doing nothing to intervene and save him, not even firing weapons. They later told other motorists that their orders are to only open fire when attacked, Bama said. Then there is the cell phone video, one of several provided to VOA by the soldier after describing what he called “the military way” of fighting the insurgency. The roughly 2-minute video, whose date places it on May 26, show the throat-slitting of at least four men by what appears to be members of the Nigerian military or security agencies. In the video, the soldiers direct the killings; two are performed by the soldiers themselves, as two other men wearing civilian clothes hold down the victims on the rim of a shallow grave dug in sandy soil. One killing involves the participation of a civilian man who is ordered to help cut one of the victim’s throats and appears repulsed by the act. The soldiers speak a mixture of pidgin English with distinctively Nigerian accents, and Hausa, as opposed to Kanuri, the language common to the vast majority of Boko Haram’s adherents. The victims say nothing audible. The soldier who provided the video to VOA, a lance corporal with the 7th Division, provided it and others during a meeting in Borno state, on the condition that neither his name nor the location of the meeting be revealed. VOA was unable to independently confirm the authenticity of the video, but was able to analyze its digital “fingerprints,” as well as the dialect of the soldiers, their mannerisms, equipment and the surrounding environment. The video was also viewed by one outside expert, who said it appeared authentic. Amnesty International also published parts of a video that appears to have been shot during the same incident, with different camera angles. “There was a father who begged us to kill his son because he said if we don’t, the son will kill him,” he said. Mike Omeri, director of the National Information Center, established by the government in the wake of the schoolgirls kidnapping, said officials were aware of this and other videos, and suggested that video was taken somewhere else in West Africa. “I have no confirmation that these are members of the armed forces. The armed forces, the armed forces that I know, are professional. They have been everywhere around the world, and they have not done that,” he said. “These (allegations) are false and are within the imagination of those who want to take Nigeria to the cleaners…. Nigeria is a civilized democracy. We wouldn’t use torture and arbitrary arrests as a means to end this insurgency. It has only faced those who have been found to be killing people and we have arrested, the people who have been arrested, are facing interrogation, they are alive, they have not been killed,” Omeri told VOA. “The Nigerian armed forces will not degenerate to that level. We don’t do this. We are not barbaric, we are not cannibals. We are not like that, either as individuals or as the armed forces of Nigeria,” he said. For the Nigerian military, “the military way” may seem like the best way to counter the threat and fear being inflicted with increasing intensity by Boko Haram. For outside observers, however, these tactics may have the opposite of their intended effect: breeding resentment and anger among the populace, and adding to support for Boko Haram. “The JTF has engaged in excessive use of force, physical abuse, secret detentions, extortion, burning of houses, stealing money during raids, and extrajudicial killings of suspects,” Human Rights Watch said. “I don’t think there’s any question that the heavy handed response by the Nigerian forces has emboldened Boko Haram and alienated the larger community, neither of which are helpful in protecting the local population nor countering the threat of Boko Haram,” said Sarah Margon, head of the rights group’s Washington office. As Goes Nigeria, So Goes West Africa? For now, few think Boko Haram poses an existential threat to the Nigerian state. Where concern is growing is the group’s ability for funding its operations, for seizing and holding large swaths of territory, particularly in porous border areas. In a region peppered with failing states—think Mali, Niger, Chad, Central African Republic– that makes the group much more dangerous. “Not only has Boko Haram engaged in attacks in neighboring countries, but it has also created instability in countries that don’t have the resources to fight it,” Pham said. In the weeks after the kidnapping of the schoolgirls in April, the Jonathan government initially spurned offers from the United States, Europe and elsewhere to help in the search. As outrage mounted, however, Nigeria relented. In May, members of the U.S. Air Force deployed in Chad, began flying drone missions, as well as reconnaissance missions with a specially equipped plane. Boko Haram was formally identified in November 2013 by the U.S. State Department as a Foreign Terrorist Organization, a designation intended to make it harder to finance terror groups. But the United States has also voiced concerns with potential rights abuses by Nigerian security forces. In 2012, under a law known as the “Leahy Amendment,” which bars U.S. aid to foreign military units found to have committed abuses, the State Department refused requests from 211 Nigerian security officials who sought U.S.-funded training. And a Nigerian army battalion that served in Mali helping to fight an Al-Qaeda-linked group there reportedly faced restricted access to U.S. aid as well. Whether the Jonathan government has any interest, or need, in retooling its approach is unclear. On July 22, Boko Haram destroyed a key bridge into Cameroon, further disrupting commerce and trade heading for Maiduguri. Two days later, the government announced it would be joining with Cameroon, Chad, and Niger to create a 2,800-member regional military force to fight the militants. For some residents of Borno, in the face of horrific violence, defiance mixes with resentment at the government’s ineffectiveness. 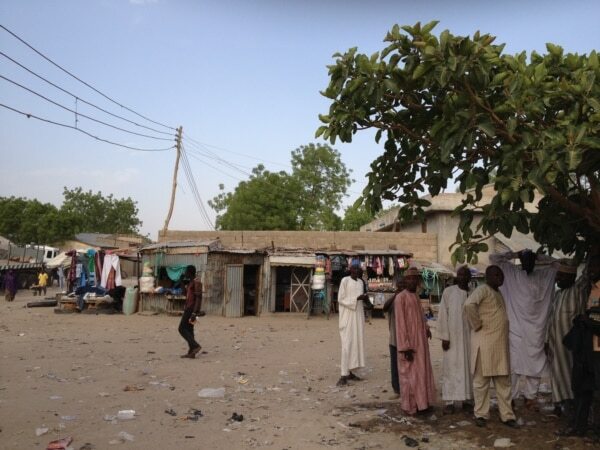 After militants took over several neighborhoods in Maiduguri in 2012, local residents began organizing self-defense, vigilante groups, armed with machetes, bows-and-arrows and sticks. Officials acknowledge the groups helped drive the gunmen out of the city. Rights groups say the vigilante organizations may have been involved in lynching alleged militants. In the small farming town of Mainok, south of Maiduguri, Boko Haram militants have attacked and burned the high school there three times since 2012. After the most recent incident in March, Borno State Gov. Kashim Shettima traveled to the school, vowed to rebuild the school and tried to reassure residents. 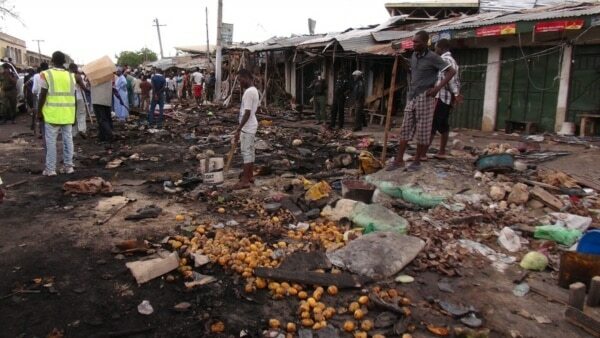 Two hours later, as if to taunt Shettima, Boko Haram militants returned and torched much of the rest of the town. Posted on 6th August 2014 by newsafrica. This entry was posted in #BringBackOurGirls, Africa, African Security, al Qaeda in Africa, Boko Haram, Christainity, Democracy, Human Rights Violations, Islam, Nigeria, President Jonathan, Religion, Terrorism, Women's Rights and tagged Amnesty International, Boko Haram, Borno State, Chibok, Goodluck Jonathan, Maiduguri, Nigeria, Nigerian Armed Forces. Bookmark the permalink.